► ALPACA is specialist in personalized trek in Nepal. Each trek is adaptable according to your wishes. The highlight of this trek involves 16th century monasteries remain active, adorned with unrivalled frescoes. Mustang is the land of Barley field's pastures for grazing herds. The trail above Kali Gandaki River tantalized a generation of trekkers. Mustang is considered as a restricted area, and there are some government formalities like obtaining a special permit. 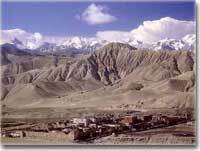 The major attraction of this trek is Lo Manthang, the impressive walled capital. Above Lo Manthang is Tibet and our excursion takes near to Tibet territory. Service Excludes: lunch/dinner at Pokhara and Kathmandu, domestic airport tax, laundry, telephone calls, emergency evacuation if required, donation, tips and all personal nature expenses, sleeping bag. Note: Clients are suggested to give maximum of 12 Kg. of personal luggage to the porter. Day 01	Arrival at Kathmandu (1350m), transfer to hotel. Day 02	Around 9.30 AM in the morning there will be formalities of meeting the guide and brief information of the tour of the day. We start the tour for discovering the extraordinary city. The program will be: Bhaktapur Durbar Square monuments with their wooden pagoda-temples, the Bodnath or Swayambhunath’s Buddhist sanctuaries and Pashupatinath, a holy Hindu temple where the cremations process of Hindu religion takes place, and, including many temples spread about along the crowded and busy streets of the antique city. Day 03	Kathmandu - Pokhara. In the morning transfer to the domestic airport. A 30mn flight to Pokhara. Free afternoon in Pokhara. Day 04	Pokhara - Jomosom (2700m)- Kagbeni (2800 m) Early morning breakfast and transferred to airport for Jomsom flight. On landing in Jomsom our trekking staffs will meet you at the airport and after some formalities at Jomsom, we leave Jomsom, on the trail it is interesting to look for the famous black stones which contain the Kali Gandaki famous sea fossils (40 million years old). Kagbeni is a surprising stronghold village closing the Mustang valley. Camp nearby. 3 hours walk. Day 06	Chhuksang - Samar (3540m). We have to go along the Kali Gandaki, called now the Mustang Khola, we cross the iron bridge and make a steep ascent onto the terrace ahead to reach Chele (3050 m). The village is clean, very inward looking and perched on a place which allows the checking of all the valley movements. We already can feel the change of ethnic groups and customs. Then the trail after Chele is desolate desert, climb the unstable pebble an come up on a small plateau, closed by a surprising bottleneck of stone penitents. After a view of Gyagar village, a wall-surrounded village we pass through small pass (3530 m), continue the trail is through gentle mountain flank and little downward and come to Samar village, surrounded by poplar grove, a good irrigation system and friendly people. Campsite near the village. 4.30 hours walk. Day 07	Samar - Geling (3520m). The trail climbs above Samar village on the ridge and crossing many valley by going up and down many times. After crossing few hamlets, namely Bhena & Yamdo, a long ascent starts to Baga La pass (3870 m) which is pilled by stones. We descend, pass the valley, here we will find a holy cave fervently venerated by the inhabitants (especially a Chorten shaped stalactite). Way up across another canyon, spectacular too, till Shyangmochen (3700m) where we rejoin the main trail. After crossing another short pass (3860m) and descend the path, crossing a stream, move along the stone walls in the farm field we finally come to small village of Geling (3520m). Geling village have houses scattered in wide area where as almost all the villages in Mustang are close by, this is the difference of Geling village, where we have our camp today. 3.30 hours walk. Day 08	Geling - Tragmar (3800m). We start with climbing gentle slope and after a while an ascent come to the pass Nyi La (3950 m), the highest pass of the course and again enter the center of Mustang , also called the Lo region. We continue walking down and around the valley to reach village Ghami (3520 m). From Ghami we cross the river and start a steep ascent about 45 minutes and walking straight for about 2. hours, reach to Tragmar. Specialty of this place is for having long standing cliff with red colors, it is an eye catching spot for the day as we camp for the night here. 5 hours walk. Day 09	Tragmar - Lo Gekar - Tsarang (3580m). After a steep ascent to the Lo Gekar monastery, we visit the 11th century ancient monastery. The trail goes on more easily till the Tsarang big village, where we camp. Village is overlooking monastery. Around that village there are numeral remarkable points we can visit too, such as the big chorten at the beginning way from Gemi. 7 hours walk. Day 10	Tsarang - Lo Manthang (3750m). On the way out of Tsarang we pass nearby a turbine which once provided electricity to the village. Several mills work on that torrent and a big chorten marks the way out of the village. Many "troglodytes" settlements are towering us. A dry valley, which progressively becomes greener, leads us to a pass where prayer flags are flapping at 3870m. We overlook the Lo Manthang valley. There is a short walking hour for arriving below the Mustang capital walls. The place has two gates: the main one on the north, the second one, unobtrusive and discreet, on the south. Camp outside the place. 4 hours walk. Day 11	Lo Manthang and around. Generally, the King honors us with his presence if we request an audience. We will pay homage to him while drinking a salt and butter tea. Camp at the same place for three nights. Visit by horse to Chussar (here the site of high school and Garphu & Narphu gompas are worth visiting) & Thinkar valley, King’s summer palace near to Tibet border. It’s a day tour and back to Lo Manthang. Whatever the mood of the authorities, there are numeral hikes around Lo Manthang, amidst barley, mustard and buckwheat fields. Day 12	Lo Manthang and around. Today the day hike tour can be up to Namgyel Gompa, also called the monastery of victory. It is situated in a setting stop a desolate ridge, is of the Gelup tradition and is the newest and most active gompa in Lo Manthang. Its not a long tour and we get back to Lo Manthang again for the night. Day 13	Lo Manthang - Yara (3580 m). After an expended and memorable visit of such a historical places in Lo Manthang we start our walk today with a easy start. We walk in the flat path for about 2.30 hours without any strenuous trail and then lately gentle descending down ward. But, before reaching Dhie village it’s a steep down walk for half an hour and we reach Dhie village. After crossing Dhie village we come to cross the river on a metallic bridge and also enjoy walking on the bank of the river. Now we have a steep climb up for about an hour and some gentle steep walk before coming to Yara. Todays walk would be 6.30 hours walk. Day 14	Explore Yara by visiting Lori Gompa. As a rest day at Yara, we should not miss to visit Lori Gompa. We ascend toward Gangra village and then to Lori – Gompa. It is also considered a traditional trail. The gompa is situated in a rock. After having a time to explore Lori Gompa , we retreat back to Yara again for the night stop. Day 16	Tange - Tetang (3050m). It’s a long day today because as often in Nepal, there are switchbacks! Firstly an horizontal trail till the torrent, then it steeply rises to 4100m. We have a 3h “level” Nepalese walk and we drop to Tange, uphill from Chhuksang. Tange is a fortified village which slowly dies out cause of a water problem not flowing till the village. Camp site nearby. A great moment of that trekking amidsts a titanic atmosphere. 7 hours walk. Day 17	Tetang - Muktinath (3650m). An easy 3h 30 way up to a pass leading to Muktinath. After having crossed that pass we leave Mustang. Muktinath sanctuary visit. Campsite nearby. 6 hours walk. Day 18	Muktinath - Jomosom. An easy day regularly dropping. We are now on the Annapurna Round trail. Passing Jarkot, a nice village overlooking the valley. Camp and last night with our local staff. 5 hours walk. Day 19	Jomosom - Pokhara - Kathmandu flight. Transfer to hotel. Day 21	Free morning & afternoon for shopping, in the evening farewell dinner is arranged. Day 22	Transfer to airport for final departure.